The Great Recession created havoc around the globe. When the housing bubble popped in 2007, the world received a quick lesson in subprime mortgages, mortgage-backed securities, leverage, derivatives and bailouts. Bear Stearns collapsed. Lehman Brothers went bankrupt. Housing prices plummeted, putting many hardworking people underwater on their home loans. Foreclosures hit all-time highs across the U.S. In short, the housing sector became a black spot in the market. Traders avoided it after being burned, unsure of if or when it might make a bounce back. Ever since the U.S. real estate market crash of 2007 through 2011, people have been hesitant to invest in it once again. That’s understandable, as people in the U.S. could have lost an average of about 25% of their home value if they had sold at that point. 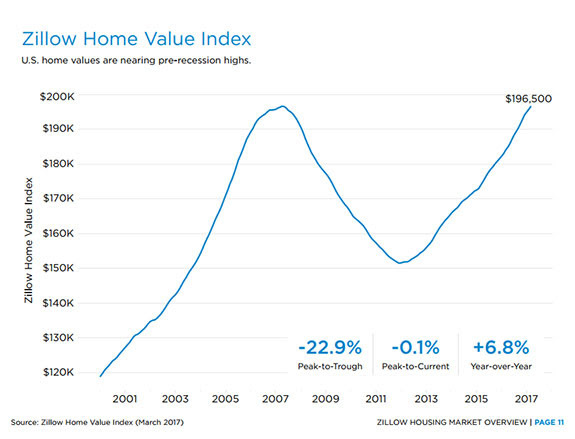 But since then, as the chart below indicates, home values have rebounded back to their former highs. In fact, a significant majority of housing data points to a market that has at least three to four years of strong growth ahead of it. One example that stands out is the high growth rate of new-home sales in the U.S. since 2010. At the end of July 2010, the total new homes sold hit a low of 315,000. Sales have been on a steady growth trajectory ever since, reaching 610,000 at the same time this year. That’s 94% growth in just seven years, a clear sign of strong demand for new homes. And it looks like this is just the beginning. The last time new-home sales made an all-time high was in July 2005 — a peak of 1,389,000. There is still room for growth in the triple digits over the next seven to 10 years as the housing market continues to rebound from the financial crisis. The number of new building permits in March of 2009 hit a low of 513,000. Eight years later, the number is up to 1,254,000 — almost 145% higher. Something else to note about this July’s results is the rebound achieved after a two-month decrease. This bounce is a great sign for demand in the housing market, as an increase in building permits means that more new homes will be built and sold. The National Association of Home Builders forecasts another 17% of growth in the number of building permits through 2019, bringing the monthly total to 1,439,000. The low-interest-rate environment has also fueled growth in housing market. With lower rates, people are more inclined to buy than rent, and the low-interest-rate trend is something that is projected to continue for the next four to five years. The Congressional Budget Office predicts that interest rates will remain below 3% through 2021 (the current level is 1.25%). Although rates are expected to grow, it will be a slow process, and they will be low compared to the 6% level of 2000 and 5% level of 2006. A way to play this growing house market in the stock market is through Louisiana-Pacific Corporation (NYSE: LPX). Louisiana-Pacific is in the business of manufacturing and selling homebuilding products for new homes and light industrial and commercial buildings, as well as repair and remodeling products. While most of its business is done in North America, the company has a growing presence in South America as well. LPX has a dominant presence in North America. It is the leading producer of oriented strand board (OSB), which is an alternative to plywood that has quietly been taking over the market since 2001 because of its superior durability. In fact, OSB is now used for 70% of all floor, wall and roof sheathing in North America, and again, Louisiana-Pacific is at the forefront of this trend. The company is also the only producer of OSB in South America, and its South American portion of OSB sales only contributed 6% of its overall revenue. Currently, LPX has two OSB plants in Chile, with a third currently be built, as well as one in Brazil. This is an area where there is plenty of growth potential, being the only producer of a homebuilding staple in an entire continent. LPX is also the leading producer of wood siding in North America, and in 2016, OSB and wood siding contributed 46% and 34% of LPX’s total revenue, respectively. Although LPX has had some volatile earnings over the past several years, I think it will remain in an overall uptrend for the next five-plus years. If the housing market continues to expand as expected and interest rates remain relatively low, the firm will have plenty of demand for building, remodeling and renovating new homes and commercial properties. A large majority of LPX’s segments have had steady revenue growth over the past five calendar years (2012 through 2016). OSB (46% of revenue) has grown 6% per year, and siding (34%) and engineered wood products (13%) have grown by about 11% each. The remaining revenue is made in its South American segment, which has plenty of room to expand, as LPX is the only OSB provider on the continent. Another bonus is that LPX has minimal debt to worry about. At the end of June 2017, it reported a total of $354.1 million in debt, compared to $740 million in cash. Many companies in the building and construction industry have much higher debt levels to worry about, so it’s just one more thing that makes LPX attractive against its competitors. With interest rates projected to remain low for the next several years and strong demand for new houses evident in the growth of building permits and new home sales, Louisiana-Pacific should have strong business growth in the years ahead.